ACEINNA’s inertial systems provide end-users and systems integrators with fully-qualified MEMS based solutions for measurement of static and dynamic motion in a wide variety of challenging applications, including autonomous driving, avionics, drones, robotics, and precision agriculture. ACEINNA’s success in developing innovative sensor modules and integrated sensing systems is the result of its combined expertise and intellectual property in sensor characterization, MEMS sensor integration algorithms, and application-specific requirements. In addition, ACEINNA’s inertial products are designed and tested to meet industry-standard and/or customer-specific environmental requirements. In 2006, a typical IMU measured 12 cm on each side (1700 cm³). Today, ACEINNA’s latest IMU delivers higher accuracy and processing power from a module less than 1 cm³ in size, at 1/100th of the original cost. The ACEINNA IMU380ZA inertial sensing module has been engineered to lead the way in precision agriculture applications, with a MTBF greater than 50,000 hours and low power consumption, all from a compact package that weighs less than 17 grams. ACEINNA has shipped over 50,000 inertial systems for installation in heavy machinery and deployed inertial navigation units in over 600 types of aircraft. The INS1000 is a state-of-the-art, high performance integrated navigation system with built-in GNSS and inertial sensors. It offers dual frequency RTK and tight coupling between GNSS and inertial sensors, to provide cm-level accuracy, enhanced reliability, and superior performance. 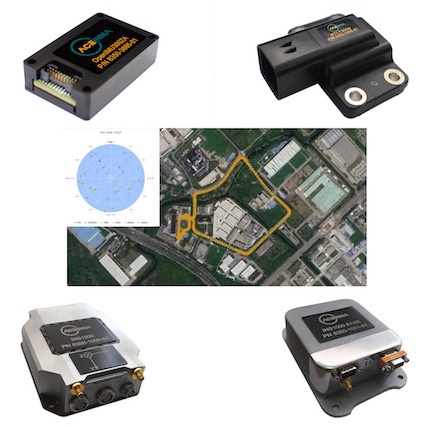 The Automotive Dead Reckoning (ADR) solution delivers strong performance in GNSS challenged urban environments.